Ughh my Fitbit is ruining my life. But also probably kind of making it better in some totally annoying way. It used to just be that I had to work to get 10K steps throughout the day. No problem. If I couldn’t get them done during the workday, I’d run around with my pup when I got home or walk some laps around my house (legit, this is something I do now. What can I say? Boston is cold in the winter). But last week, FitBit made an update. Not only do they want me to get 10K steps in each day, but they want me to take 250 steps during every hour from 9-5. Some of you probably think that sounds totally pathetic… But when you have a desk job and are sometimes in conference room meetings for hours at a time, it’s actually really tough. My anxiety to get my hourly steps in is now through the roof. I’ve done one day where I’ve reached 250 steps for all 8 hours, but most days I’ve been falling short. Short of doing laps around the office or running in place in my office (my co-workers will think I’ve gone crazy), it’s nearly impossible for me. I was in long meetings all morning today and then this afternoon, I realized that I sat at my desk for 2 hours completely in the zone and not taking a single step. Thanks to Fitbit, I actually feel guilty about having a super productive workday. With more and more data coming out on how horrible desk jobs are for health (basically, I’m going to die tomorrow), I at least try to eat well when I’m at work. Another thing that can be super challenging with a desk job. And breakfast is really, really important for me. I’m the kind of person who is literally hungry every hour and my stomach is constantly growling… Which is always fun in client meetings. I bring Special K oatmeal to work often, but it contains a little more sugar than I’d like. So, when I spotted this Cooking Light recipe for Overnight Bulgur Breakfast Bowls, I whipped them right up for a take-to-work-breakfast. The bulgur is super easy to prepare and the toppings are as versatile as you like. 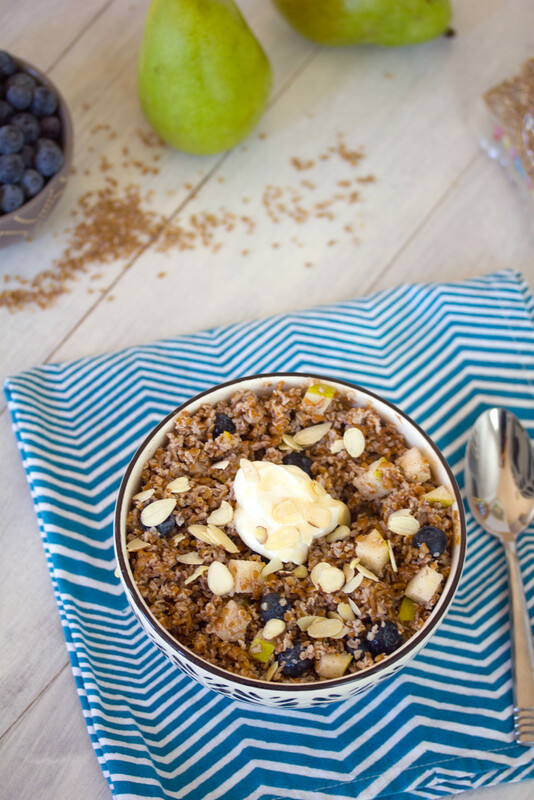 I kept my toppings for these breakfast bowls simple with pears, blueberries, sliced almonds, and Greek yogurt. Cooking Light actually utilized a blended Greek yogurt and goat cheese, which sounded seriously delicious, but not something I really wanted first thing in the morning. 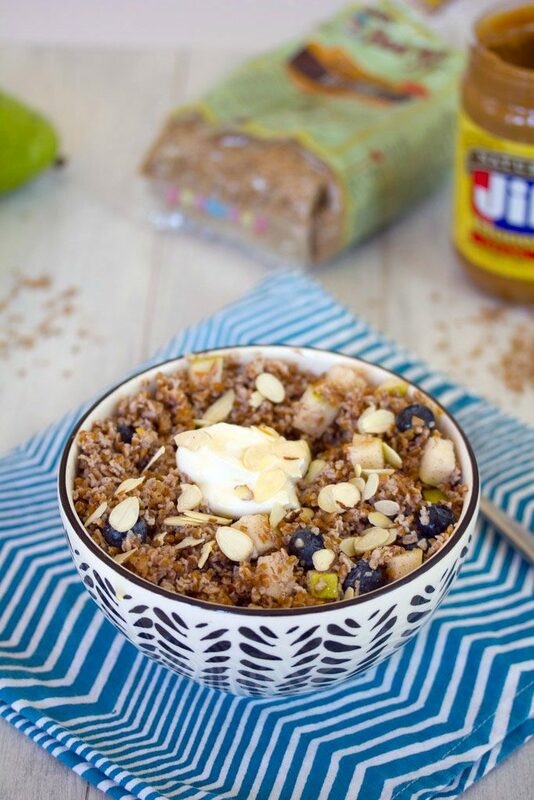 The bulgur is “overnight” in that you soak it in milk while you sleep (like overnight oats). I soaked mine in Almond Breeze coconut almond milk, but you could use anything. I also used Jif’s honey peanut butter, which probably has more sugar than I need, but I’m trying to ween myself off the packaged oatmeal and this peanut butter is so, so good. I may or may not have also drizzled honey over the top. Only because Cooking Light told me to. I think pears are one of the most delicious fruits. But it’s also so easy to get a not so great pear, that I don’t eat them as much as I should. I’m excited to see that more and more brands are jumping on the pear bandwagon with their new food products. The pears that I got for my breakfast bowls were perfect. Blueberries are always a good idea and probably my number one most favorite fruit. 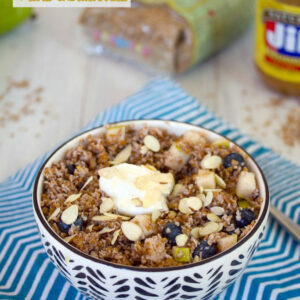 After you let the bulgur soak overnight, you simply mix in the peanut butter and add on your toppings. The result is a super creamy and satisfying breakfast that is way better than the average oatmeal. The best part (besides the deliciousness)? It kept me full for way longer than average. Which means I have a couple added hours before my stomach starts obnoxiously growling in an otherwise quiet room. I think I’m going to have to make breakfast bowls a regular thing in my life! 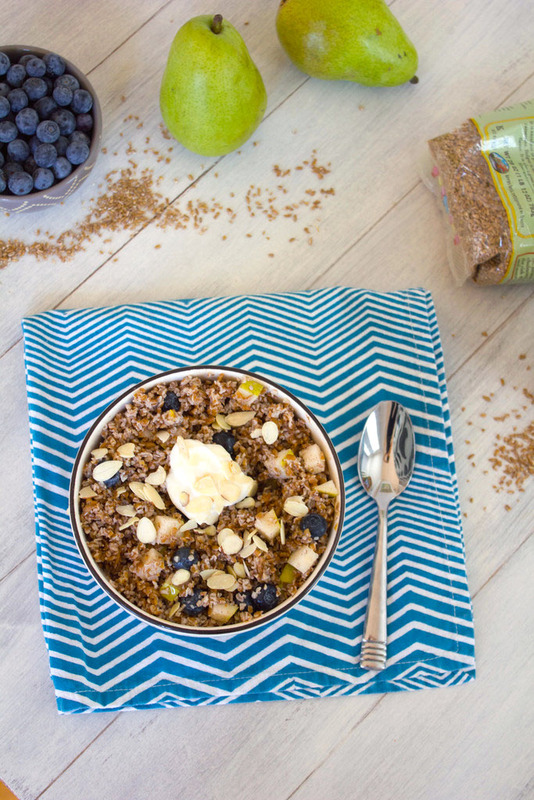 The only “negative” to this breakfast swap is that I do miss my hot oatmeal a little bit. But with summer on the way (hard to believe, but that’s the rumor going around), I’m sure I’ll get over that quickly. Now, I am anxiously waiting for blueberry season to arrive; I haven’t been able to find them for weeks and miss them so. So, now when hours go by without me getting my 250 steps, it’s likely because I’m sitting at my desk eating this oatmeal. And because I don’t have to get up from my desk and walk to the kitchen nearly as often. And I refuse to feel bad about it. So, take that, Fitbit. As long as I’m getting my 10K steps a day in, you should just mind your own business and stop monitoring me every minute of my life. And yet I remain tied to you. Sigh. Do you have a desk job or do you get to get up and move? 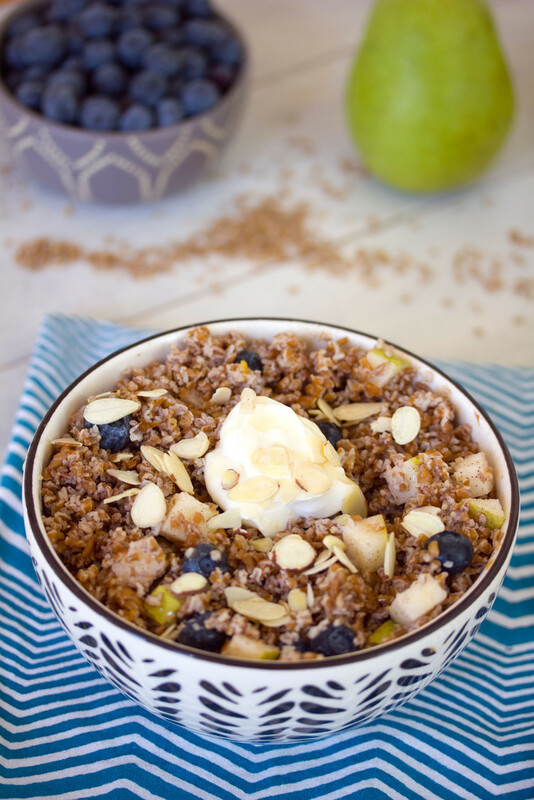 Easy to prep, these Overnight Bulgur Breakfast Bowls with Pears and Blueberries will keep you satisfied for hours. Must be those healthy grains, peanut butter, fruit, and nuts! Combine uncooked bulgur and coconut almond milk in a medium-sized bowl. Cover and refrigerate overnight. In the morning, fluff grains and stir in peanut butter and cinnamon. Toss with chopped pears and blueberries. Serve in individual bowls and top with Greek yogurt, sliced almonds, and honey. 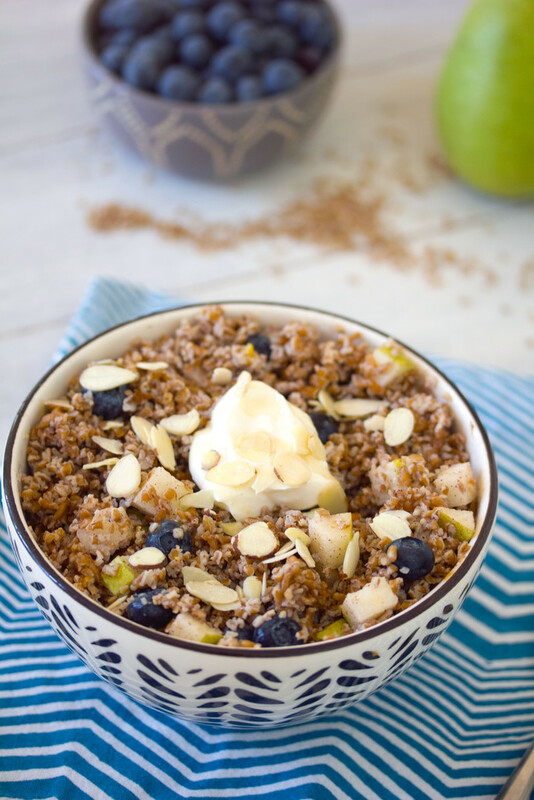 10 Responses to "Overnight Bulgur Breakfast Bowls with Pears and Blueberries"
I’ve never actually tried bulgur before, but it sounds delicious! Breakfast bowls are my favorite, especially when they’re loaded with fresh fruit. Sounds like a delicious way to start the day! 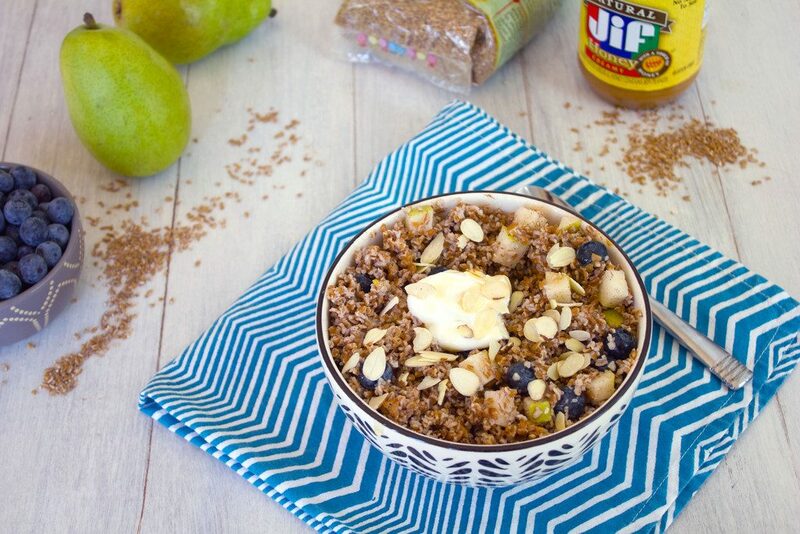 This is such a healthy way to start your day, and delicious to boot. I’m gonna have to give this recipe a try. 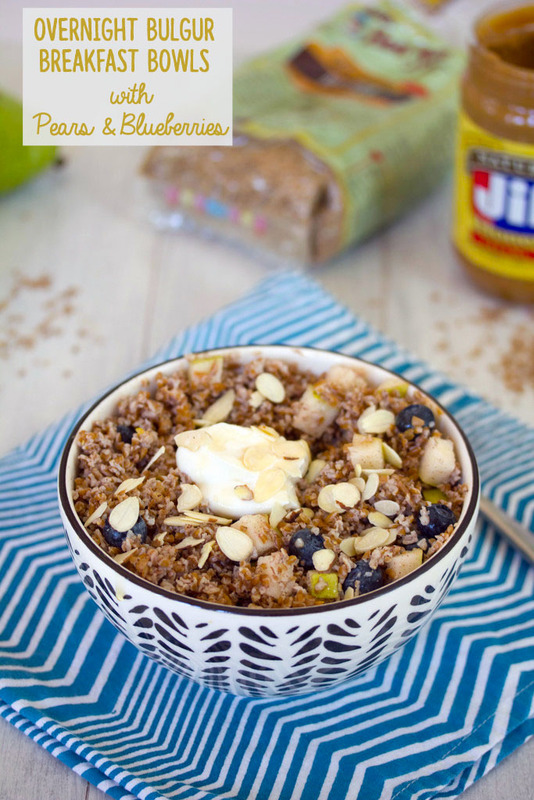 what a fun way to eat more bulgur! i love that stuff! and i totally get what you’re saying about the fitbit. 2 weeks ago, my sister gave me one of her old ones and i’ve gotten a little obsessed. but the 250 steps in an hour during the day can be tough with meetings! I’m with ya. I barely move during the day and it’s awful. This b-fast will get me moving to the kitchen! Isn’t it crazy how we live by our FitBits now? I never thought that would be the case, but I don’t have a 250 an hour step goal. Did you upgrade your account? On a different note, LOVE the bowl. We’ve been looking for ways to get more whole grains into our diet and this looks spot on. Thanks! I halfed the recipe! It is a lot of food for one person. I’m using bulgur for tonight’s dinner. Hopefully I’ll have enough to make this for breakfast too! I never thought of bulgur for breakfast! This is such a filling and hearty breakfast dish!